Fortify™ Daily Probiotic - Nature's Way®. 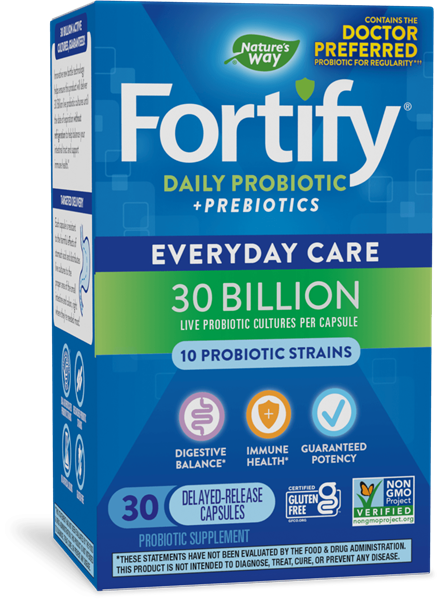 Be 30 billion strong every day with Fortify™ Daily Probiotic. It’s a potent dose of good bacteria that includes researched strains BI-04® and Bl-07®. Formulated with Lactobacilli and Bifidobacteria probiotic strains, this formula is your powerful ally for maintaining daily digestive and immune health. * Plus we use delayed release capsules to help protect the probiotics from the acidic environment of the stomach. NCFM® and Bl-04® are trademarks of DuPont. In the USA, NCFM® is a trademark of the North Carolina Agriculture Foundation, Inc. NCFM® and Bl-04® are used under license.